Gordon Lester Varney age 72 of Kimper, Kentucky passed away Thursday, November 15, 2018 at the Pikeville Medical Center. 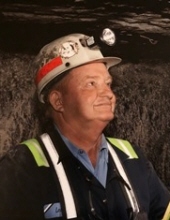 He was a Coal Miner and was Mine Manager. Lester was born at Kimper, Kentucky on July 9, 1946 the son of the late John and Lily Rose Bostic Varney. Along with his parents, he was preceded in death by his wife, Eileen Layne Varney, two sisters, Jeanette Owens and Jenell Turnmire and seven brothers, Ance Varney, Ernest Varney, Armon Varney, Rora Varney, Sid Varney, Ralph Varney and Henry Varney. He is survived by one son, Gordon Lester (Crystal) Varney II of Kimper, Ky. and one daughter, Kristi (Kyle) Weddington of Kimper, Ky. He is also survived by one brother, Jessie Varney of Kimper, Ky., and also several loving sister-in-laws and brother-in-laws, and three grandchildren, Kylea Weddington, Tyler Weddington and Jordon Varney. To send flowers or a remembrance gift to the family of Gordon Lester Varney, please visit our Tribute Store. "Email Address" would like to share the life celebration of Gordon Lester Varney. Click on the "link" to go to share a favorite memory or leave a condolence message for the family.